This past weekend I was goofing around on the computer installing the new Windows 10 operating system (so far, so good by the way), when I stumbled across some online publishing software I downloaded for muy daughter a few years ago when she wanted to print her own paperback book that she could keep in her personal library of children’s books. 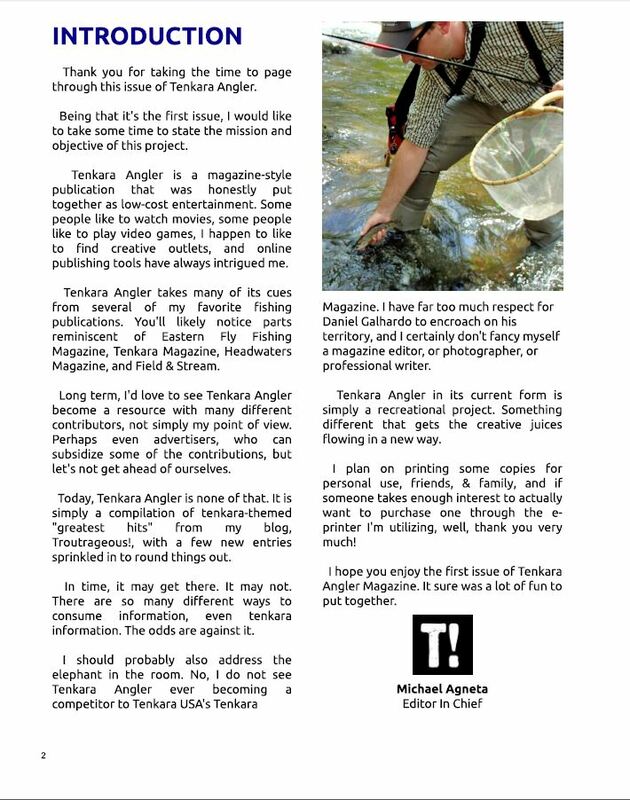 Being a tinkerer by nature, one thing led to another and over the course of Friday night and Saturday afternoon I ended up using that software to throw together some tenkara-themed articles and pictures that I’ve posted to the blog in the past, sprinkled in a little bit of new content, and created a magazine called Tenkara Angler. By dating it “Fall 2015” the allusion is to Tenkara Angler being a quarterly publication, although who really knows. This could easily be the first and last issue. I suppose it can serve as a test to gauge interest, of both consumption and collaboration. As you’ll probably notice in the “Introduction” excerpt, I’m open to pretty much anything. If nothing else, it was an entertaining creative outlet and diversion from the blog for a few days. Putting together the pagination was pretty fun, and honestly fairly easy with the Blurb software, although the result of all of the editing is far from professional quality; my fault, not theirs. I always wanted to write my own book or magazine. Something I could read or gift and then “display” on a coffee table alongside copies of Fly Tyer, Eastern Fly Fishing, and Field & Stream.